Guilbaud, R., Slater, B.J., Poulton, S.W., Harvey, T.H.P., Brocks, J.J., Nettersheim, B.J., Butterfield, N.J. (2018) Oxygen minimum zones in the early Cambrian ocean. Geochem. Persp. Let. 6, 33–38. This work was funded by NERC (NE/K005251/1). SWP acknowledges support from a Royal Society Wolfson Research Merit Award. The relationship between the evolution of early animal communities and oceanic oxygen levels remains unclear. In particular, uncertainty persists in reconstructions of redox conditions during the pivotal early Cambrian (541-510 million years ago, Ma), where conflicting datasets from deeper marine settings suggest either ocean anoxia or fully oxygenated conditions. By coupling geochemical palaeoredox proxies with a record of organic-walled fossils from exceptionally well-defined successions of the early Cambrian Baltic Basin, we provide evidence for the early establishment of modern-type oxygen minimum zones (OMZs). Both inner- and outer-shelf environments were pervasively oxygenated, whereas mid-depth settings were characterised by spatially oscillating anoxia. As such, conflicting redox signatures recovered from individual sites most likely derive from sampling bias, whereby anoxic conditions represent mid-shelf environments with higher productivity. This picture of a spatially restricted anoxic wedge contrasts with prevailing models of globally stratified oceans, offering a more nuanced and realistic account of the Proterozoic-Phanerozoic ocean transition. Figure 1 Core location (red circles) and stratigraphy, modified after Nielsen and Schovsbo (2011). Grey and white shadings represent the stratigraphic sequences (e.g., LC2-5). The bars illustrate the analysed core sections (on mudstones and siltstones only); euxinic, ferruginous and oxic depositions are in purple, black and blue, respectively. Figure 2 Geochemical data. Inner-, mid-, and outer-shelf environments are indicated by open, red and black symbols, respectively. Grey shadows delimit redox domains and dashed lines represent average shale values. Black arrows are for outpassing data points. Maximum values for U/Al and V/Al are 54 and 434 ppm/wt. %, respectively. Figure 3 (a) Distribution of redox ratios (n = 183), binned as a function of their depositional environment. Inner- and outer-shelf environments show significantly more oxic redox populations than corresponding mid-shelves (t test p << 0.05). (b) Example of m/z = 134 partial ion chromatogram revealing the presence of 2,3,6 trimethyl aryl isoprenoids (AI) in mid-shelf facies. High ratios of short- to long-chain AI (AIR) point to strongly varying, intermittent oxygen exposure levels. (c) SCF assemblages from (i) inner-shelf (denticulate metazoan structures), (ii) mid-shelf (protoconodont spines alongside occasional Wiwaxia sclerites) and (iii) outer-shelf environments (priapulid, palaeoscolecid and annelid remains). Scale bars are 100 μm. Figure 4 Redox architecture reconstruction, with oxic conditions above and below anoxic settings. Ferruginous conditions dominate in the OMZ, but euxinia develops in zones of increased organic carbon delivery. Metazoan body fossils recovery is shown by the red stars. 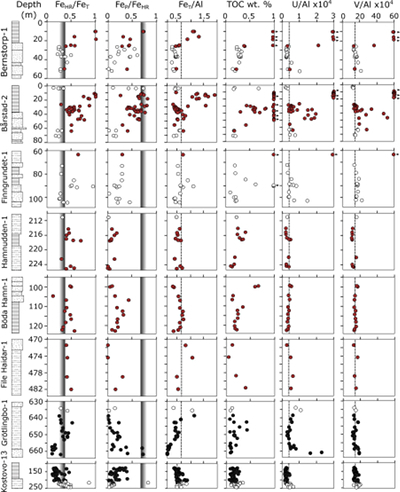 Evidence for phototrophic GSB (green ovals) in mid-shelf settings corroborates geochemical and palaeontological redox indicators. Canfield, D.E., Poulton, S.W., Narbonne, G.M. (2007) Late-Neoproterozoic Deep-Ocean Oxygenation and the Rise of Animal Life. Science 315, 92–95. Chen, X., Ling, H.-F., Vance, D., Shields-Zhou, G.A., Zhu, M., Poulton, S.W., Och, L.M., Jiang, S.-Y., Li, D., Cremonese, L., Archer, C. (2015) Rise to modern levels of ocean oxygenation coincided with the Cambrian radiation of animals. Nature Communications 6, 7142. Von Strandmann, P.A.P., Stüeken, E.E., Elliott, T., Poulton, S.W., Dehler, C.M., Canfield, D.E., Catling, D.C. (2015) Selenium isotope evidence for progressive oxidation of the Neoproterozoic biosphere. Nature Communications 6, 10157. Li, C., Jin, C., Planavsky, N.J., Algeo, T.J., Cheng, M., Yang, X., Zhao, Y., Xie, S. (2017) Coupled oceanic oxygenation and metazoan diversification during the early–middle Cambrian? Geology 743–746. Poulton, S.W., Fralick, P.W., Canfield, D.E. (2010) Spatial variability in oceanic redox structure 1.8 billion years ago. Nature Geoscience 3, 486–490. Planavsky, N.J., McGoldrick, P., Scott, C.T., Li, C., Reinhard, C.T., Kelly, A.E., Chu, X., Bekker, A., Love, G.D., Lyons, T.W. (2011) Widespread iron-rich conditions in the mid-Proterozoic ocean. Nature 477, 448–451. Poulton, S.W., Canfield, D.E. (2011) Ferruginous Conditions: A Dominant Feature of the Ocean through Earth’s History. Elements 7, 107–112. Canfield, D.E., Poulton, S.W., Knoll, A.H., Narbonne, G.M., Ross, G., Goldberg, T., Strauss, H. (2008) Ferruginous Conditions Dominated Later Neoproterozoic Deep-Water Chemistry. Science 321, 949–952. Wood, R.A., Poulton, S.W., Prave, A.R., Hoffmann, K.-H., Clarkson, M.O., Guilbaud, R., Lyne, J.W., Tostevin, R., Bowyer, F., Penny, A.M., Curtis, A., Kasemann, S.A. (2015) Dynamic redox conditions control late Ediacaran metazoan ecosystems in the Nama Group, Namibia. Precambrian Research 261, 252–271. Gill, B.C., Lyons, T.W., Young, S.A., Kump, L.R., Knoll, A.H., Saltzman, M.R. (2011) Geochemical evidence for widespread euxinia in the Later Cambrian ocean. Nature 469, 80–83. ), by which time many key metazoan innovations had evolved. Tostevin, R., Wood, R.A., Shields, G.A., Poulton, S.W., Guilbaud, R., Bowyer, F., Penny, A.M., He, T., Curtis, A., Hoffmann, K.H., Clarkson, M.O. (2016) Low-oxygen waters limited habitable space for early animals. Nature Communications 7, 12818. Jin, C., Li, C., Algeo, T.J., Planavsky, N.J., Cui, H., Yang, X., Zhao, Y., Zhang, X., Xie, S. (2016) A highly redox-heterogeneous ocean in South China during the early Cambrian (∼ 529–514 Ma): Implications for biota-environment co-evolution. Earth and Planetary Science Letters 441, 38–51. Bianchi, D., Galbraith, E.D., Carozza, D.A., Mislan, K.A.S., Stock, C.A. (2013) Intensification of open-ocean oxygen depletion by vertically migrating animals. Nature Geoscience 6, 545–548. Sperling, E.A., Knoll, A.H., Girguis, P.R. 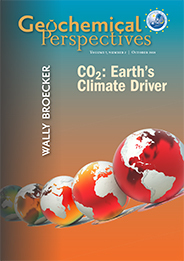 (2015a) The Ecological Physiology of Earth’s Second Oxygen Revolution. Annual Review of Ecology, Evolution, and Systematics 46, 215–235. ). Determining which of these two models, horizontal or lateral, best characterises the structure of early Palaeozoic oceans is challenged by a dearth of spatial and temporal resolution, compounded by the removal of off-shelf signals due to subduction. Here, we exploit exceptionally well-preserved successions from the Baltic Basin to derive a high resolution redox model of early to middle Cambrian shelf seas (full details of geological setting and methods are provided as Supplementary Information). Hagenfeldt, S.E. (1994) The Cambrian File Haidar and Borgholm Formations in the central Baltic and south central Sweden. Stockholm Contributions in Geology 43, 69–110. Nielsen, A.T., Schovsbo, N.H. (2011) The Lower Cambrian of Scandinavia: depositional environment, sequence stratigraphy and palaeogeography. Earth-Science Reviews 107, 207–310. Nielsen, A.T., Schovsbo, N.H. (2015) The regressive Early-Mid Cambrian ‘Hawke Bay Event’ in Baltoscandia: Epeirogenic uplift in concert with eustasy. Earth-Science Reviews 151, 288–350.
) reconstructed the depositional environment of stratigraphic successions, reporting a gradient from proximal inner-shelf to mid-shelf and outer-shelf deposition below storm wave base. Inner-shelf deposition is recognised in all cores by abundant cross-bedding features within siltstones and generally coarser lithologies accompanying falling stage system tracts (FSSTs). Mid-shelf deposition is expressed as green silts and black shales with common glauconitic horizons and silty distal storm beds. Outer-shelf deposition is recognised by the presence of laminated mudstones and bioturbated siltstones in the absence of current features.
. Grey and white shadings represent the stratigraphic sequences (e.g., LC2-5). The bars illustrate the analysed core sections (on mudstones and siltstones only); euxinic, ferruginous and oxic depositions are in purple, black and blue, respectively. Lyons, T.W., Severmann, S. (2006) A critical look at iron paleoredox proxies: new insights from modern euxinic marine basins. Geochimica et Cosmochimica Acta 70, 5698–5722. Of the eight cores analysed, seven show marked stratigraphic shifts between oxic and anoxic deposition (Fig. 2). High concentrations of total organic carbon (TOC, up to ~20 %) are associated with anoxic conditions, reflecting enhanced organic carbon preservation and supply, with the latter exerting a primary control on the development of anoxia. LC1 records dominantly anoxic conditions at the base of Kostovo-13, whereas oxic conditions prevail in the upper part of the core. Through LC2 and MC3, water column conditions are characterised predominately by ferruginous anoxia, with some euxinic horizons towards the top of Bårstad-2 and Bernstorp-1. Within these latter strata, oxic conditions prevail at the base of Grötlingbo-1 and throughout all FSSTs (Figs. 1 and 2). Zhang, S., Wang, X., Wang, H., Bjerrum, C.J., Hammarlund, E.U., Costa, M.M., Connelly, J.N., Zhang, B., Su, J., Canfield, D.E. (2016) Sufficient oxygen for animal respiration 1,400 million years ago. Proceedings of the National Academy of Sciences 113, 1731–1736. ), comparable to that seen in modern OMZs (see Supplementary Information for details). Schwark, L., Frimmel, A. 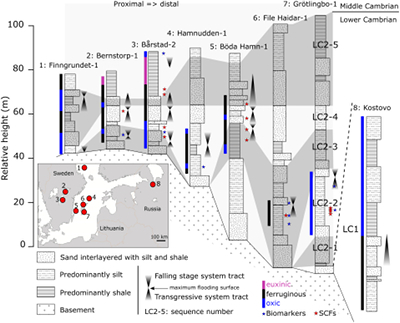 (2004) Chemostratigraphy of the Posidonia Black Shale, SW-Germany: II. Assessment of extent and persistence of photic-zone anoxia using aryl isoprenoid distributions. Chemical Geology 206, 231–248. Brocks, J.J., Love, G.D., Summons, R.E., Knoll, A.H., Logan, G.A., Bowden, S.A. (2005) Biomarker evidence for green and purple sulphur bacteria in a stratified Palaeoproterozoic sea. Nature 437, 866–870. ). Despite AI production in anoxic settings, the range and magnitude of AIR values (1.3 to 5.8) provide independent support for transient oxygenated conditions beneath the anoxic zone (Fig. 3b). Together with our Fe speciation data, this suggests that anoxic mid-depth waters overlaid oxygenated waters, enhancing oxidative degradation of AI during deposition. Butterfield, N., Harvey, T. (2012) Small carbonaceous fossils (SCFs): a new measure of early Paleozoic paleobiology. Geology 40, 71–74. Slater, B.J., Harvey, T.H.P., Guilbaud, R., Butterfield, N.J. (2017) A cryptic record of Burgess Shale-type diversity from the early Cambrian of Baltica. Palaeontology 60, 117–140. ). These palaeontological data corroborate the geochemical signatures for oxygenated inner- and outer-shelf environments (Fig. 3c). Fossilisation is of course a combination of both organismal ecology and taphonomic opportunity. Transient ferruginous conditions represent the dynamic interface between the oxic conditions where most metazoans live, and the anoxic conditions necessary to preserve non-biomineralising forms. Therefore, the apparently paradoxical persistence of SCFs in ferruginous settings may imply an iron shuttle from the core to the edges of the OMZ, enhancing the FeHR flux to oxygenated settings, or more likely dynamic oscillations between oxic and ferruginous water column conditions – in contrast to more permanently anoxic mid-shelves which were devoid of benthic metazoans and prone to euxinia. Brandt, P., Bange, H.W., Banyte, D., Dengler, M., Didwischus, S.-H., Fischer, T., Greatbatch, R.J., Hahn, J., Kanzow, T., Karstensen, J., Körtzinger, A., Krahmann, G., Schmidtko, S., Stramma, L., Tanhua, T., Visbeck, M. (2015) On the role of circulation and mixing in the ventilation of oxygen minimum zones with a focus on the eastern tropical North Atlantic. Biogeosciences (BG) 12, 489–512. Hammarlund, E.U., Gaines, R.R., Prokopenko, M.G., Qi, C., Hou, X.-G., Canfield, D.E. (2017) Early Cambrian oxygen minimum zone-like conditions at Chengjiang. Earth and Planetary Science Letters 475, 160–168. Sperling, E.A., Wolock, C.J., Morgan, A.S., Gill, B.C., Kunzmann, M., Halverson, G.P., Macdonald, F.A., Knoll, A.H., Johnston, D.T. (2015b) Statistical analysis of iron geochemical data suggests limited late Proterozoic oxygenation. Nature 523, 451–454. Butterfield, N.J. (2018) Oxygen, animals and aquatic bioturbation: An updated account. Geobiology 16, 3–16. Butterfield, N.J. (2009) Oxygen, animals and oceanic ventilation: an alternative view. Geobiology 7, 1–7. Lenton, T.M., Boyle, R.A., Poulton, S.W., Shields-Zhou, G.A., Butterfield, N.J. (2014) Co-evolution of eukaryotes and ocean oxygenation in the Neoproterozoic era. Nature Geoscience 7, 257–265. ). Although fundamental differences in pre-metazoan biological pump may have given terminal Proterozoic OMZs a distinct expression (presumably thicker and shallower), this overall geometry may have been a prevalent feature of late Precambrian oceans. 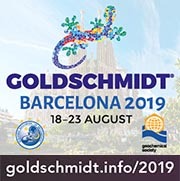 We are thankful to Linda Wickström (Geological Survey of Sweden), Ursula Toom, Olle Hints and Heikki Bauert (Tallinn University of Technology), and Tõnis Saadre (Estonian Geological Survey) for sampling support, and James Rolfe, Jason Day and Janet Hope for analytical technical support. The authors are thankful to the constructive comments of T. Lyons, C. Scott and an anonymous reviewer. This work was funded by NERC (NE/K005251/1). SWP acknowledges support from a Royal Society Wolfson Research Merit Award. RG, BJS, THPH and NJB collected samples. RG extracted and interpreted geochemical data with significant contributions from BJN, JJB and SWP. BJS extracted and interpreted palaeontological data with significant contributions from THPH and NJB. RG and BJS wrote the manuscript, with significant contributions from all co-authors. However, modern oceans exhibit a marked lateral redox variability, most notably where combinations of high primary productivity and metazoan activity (Bianchi et al., 2013) give rise to wedge-shaped oxygen minimum zones (Sperling et al., 2015a). The subsequent establishment of modern-type OMZs, as identified in the early Cambrian ocean, may have developed as a consequence of contemporaneous metazoan expansion, whereby animal activity maintains high levels of oxygen depletion in OMZs (Bianchi et al., 2013). Gentle topographical slope and reduced circulation in the relatively shallow Baltic Basin may have further exacerbated the role of benthic oxygen uptake, analogous to shallow OMZs (Brandt et al., 2015). In these anoxic environments, 2,3,6-trimethyl aryl isoprenoids (AI) likely derived from anaerobic phototrophic green sulphur bacteria (GSB), and their detection indicates that the water column was temporarily anoxic up to the photic zone (Brocks et al., 2005). The evolutionary switch from a prokaryote- to eukaryote-dominated biological pump is thought to have played an essential role in the ventilation of the deep ocean (Butterfield, 2009, 2018; Lenton et al., 2014). Our data augments emerging views of early Cambrian expanded marine oxygenated conditions (Chen et al., 2015; Li et al., 2017), supporting the establishment of a modern-like ocean architecture during the ‘explosion’ of metazoan diversity (Butterfield, 2018). 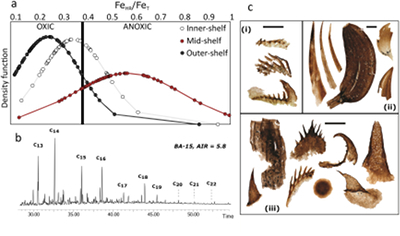 Further evidence for distinct redox conditions across the shelf comes from the record of ‘small carbonaceous fossils’ (SCFs) (Butterfield and Harvey, 2012), found in oxic inner- and outer-shelf settings and ferruginous mid-shelf environments (Fig. 1). The dramatically increased diversity of metazoan life through the late Ediacaran to early Cambrian transition (~585-510 Ma) coincides with a protracted transition from global ocean anoxia to widespread ocean oxygenation (Canfield et al., 2007; Chen et al., 2015; Von Strandmann et al., 2015; Li et al., 2017). Models for later Neoproterozoic oceans (635 to 541 Ma) also envisage redox stratification, with oscillations from strict anoxia to fully oxic conditions (Canfield et al., 2007, 2008; Wood et al., 2015). This dynamic ocean stratification is assumed to have persisted until the mid-Cambrian (Gill et al., 2011; Chen et al., 2015), by which time many key metazoan innovations had evolved. Studied sediments encompass the Lontova, File Haidar and Borgholm formations, deposited between the early Cambrian Fortunian stage and middle Cambrian Stage 5, and the internal stratigraphy and depositional environments of these siliciclastic sediments has been studied extensively (Hagenfeldt, 1994; Nielsen and Schovsbo, 2011, 2015). The discovery of OMZ denitrification in early Cambrian successions of China (Hammarlund et al., 2017) suggests that our model may have been a common feature of contemporaneous margins. Most current models linking early animal evolution to redox chemistry assume a horizontally stratified ocean (Wood et al., 2015; Jin et al., 2016). We used FeT/Al enrichments (≥0.6) to evaluate this mechanism in instances of equivocal FeHR/FeT, since the ratio remains unaffected by diagenesis (Lyons and Severmann, 2006). Nielsen and Schovsbo (2011, 2015) reconstructed the depositional environment of stratigraphic successions, reporting a gradient from proximal inner-shelf to mid-shelf and outer-shelf deposition below storm wave base. Figure 1 Core location (red circles) and stratigraphy, modified after Nielsen and Schovsbo (2011). Therefore, in order to integrate water column redox data into a palaeo-environmental framework, we used the reconstructions of shelf environments in the Baltic Basin (Nielsen and Schovsbo 2011, 2015) as binning discriminants (Fig. 3a). Throughout the Proterozoic Eon (2500 to 541 Ma), the ocean is thought to have been characterised by oxygenated surface waters overlying euxinic (anoxic and sulphidic) mid-depth waters along productive ocean margins (Poulton et al., 2010), and ferruginous (anoxic, Fe-containing) deeper waters (Planavsky et al., 2011; Poulton and Canfield, 2011). Anoxic settings promote the formation of authigenic Fe minerals in the water column, resulting in FeHR enrichments in underlying sediments, with typically FeHR/FeT ≥ 0.38 (Poulton and Canfield, 2011). For anoxic samples, ferruginous conditions are distinguished from euxinic settings by quantifying the extent of sulphidation of FeHR, whereby FeP/FeHR ≥ 0.7 is characteristic of euxinic deposition and FeP/FeHR < 0.7 indicates ferruginous conditions (Poulton and Canfield, 2011). The ratio of pristane to phytane (Pr/Ph) is low (0.46-0.79), supporting a dominantly anoxic mid-depth water column (Schwark and Frimmel, 2004). The ratio between shorter- (C13 to C17) and longer-chain (C18 to C22) AI (the AI ratio, AIR) is used as a measure of oxidative degradation during deposition (Schwark and Frimmel, 2004). In contrast to sparsely fossiliferous mid-shelves, inner- and outer-shelf facies preserved most diverse SCFs assemblages, along with conspicuous burrows and bioturbation fabrics (Slater et al., 2017). By contrast, the recognition of such structure would explain the large discrepancies reported through the Neoproterozoic-Cambrian transition (e.g., Sperling et al., 2015b). Animals are fundamentally aerobic organisms - albeit with hugely varying oxygen demands - and their early fossil record is accordingly limited to oxygenated settings (Tostevin et al., 2016). We note that for some instances of apparent oxic deposition based on Fe speciation (e.g., at the basal and uppermost parts of the Grötlingbo-1 core), U enrichments are coeval with muted V enrichments, indicating low-oxygen conditions (Zhang et al., 2016), comparable to that seen in modern OMZs (see Supplementary Information for details). However, OMZ structures may track back to older, Mesoproterozoic oceans (Zhang et al., 2016). Download Table S-1 (Excel file).